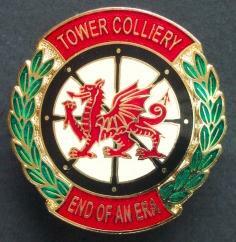 Tower Colliery (1864-2008) Closure Badge. In January 2008 Tower Colliery, near Hirwaun in South Wales, closed as the last of its economic reserves of coal became depleted. This marked the end of 200 years of deep mining in the local area. More significantly it also marked the end of a more important era as Tower Colliery was the last deep coal mine in the entire South Wales Coalfield. A coalfield which, at its peak, in the early twentieth century boasted literally hundreds of collieries and employed many thousands of men. Over its working life (1864-2008) up to 14 separate coal seams have been worked at Tower Colliery and the neighbouring mines within Tower's lease area. In the early 1994 British Coal considered Tower Colliery to be surplus to requirements due to market constraints, and the mine was closed shortly before privatisation. However, the pit famously re-opened in 1995, when it was brought out by the management and men who had worked the colliery under the banner of the British Coal Corporation. The miners each donated £8,000 each from their savings and redundancy money towards the deposit needed to buy Tower after its closure. They then ran the mine very successfully as a worker's co-operative until it reserves finally became exhausted in 2008. To mark the closure of this nationally important mine the GNB Co. have issued a limited edition badge of only 150 issues. The badge depicts a Welsh dragon mounted over a pit wheel with a surrounding memorial wreath (see below). Badge Type: High quality hard enamel complete with broach pin attachment; Size: 32 mm; Colour: Red, Black, Gold, Cream & Green; Reverse Side: Engraved on the reverse "Tower Colliery / Last Deep Mine of the / South Wales Coalfield / Closed 2008" plus a unique stamped issue identification number out of a stated total of 150; Number Issued: 150; Launch Date: March 2008; Price: £5.65 inclusive of first class P&P within the UK. To purchase via Paypal please add an extra £0.50 to cover Paypal's handling charges (i.e. £6.15 total inclusive of P&P if paid for via Paypal).